The Osteoporosis Risk Assessment Instrument (ORIA) can be used to select women for bone densitometry. This can help reduce the number of women who are screened so that resources can be used for those at risk. The authors are from several medical institutions in Toronto including the University of Toronto. women with a diagnosis of osteoporosis or taking bone active medications other than estrogen-progesterone (calcitonin, biphosphonates, fluoride). • Bone densitometry should be done if the woman has a total score >= 9. • The sensitivity was 93.3% and specificity 46.4% for identifying Canadian women with low bone density. The sensitivity was 94.4% for women with osteoporosis. Cadarette SM, Jaglal SB, et al. Development and validation of the Osteoporosis Risk Assessment Instrument to facilitate selection of women for bone densitometry. CMAJ (Canadian Medical Assoc J). 2000; 162: 1289-1294. 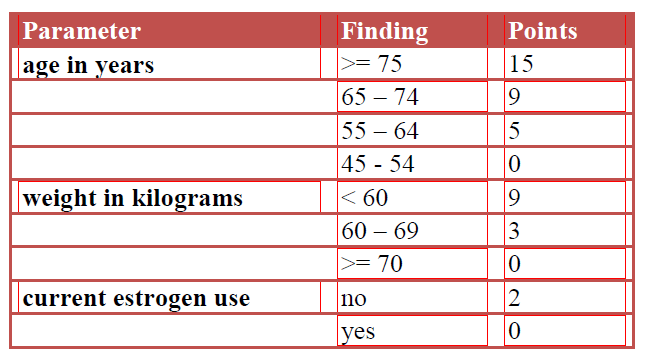 Evaluation of Different Screening Tools for Predicting Femoral Neck Osteoporosis in Rural South Indian Postmenopausal Women.